I’ve been thinking a lot about Ninja Turtles lately. I got a volume of the classic ‘toon for my birthday, so that probably has something to do with it. Whatever the reason, my reflections have naturally drifted toward just how to do the Turtles and their world justice in Freedom Force. I haven’t been able to get much work done lately because of several real real life things that have been keeping me quite busy. As a result, I don’t have a release ready for this post, but I thought that some of you out there in the ether might be interested in the subject of my ruminations these last few days. 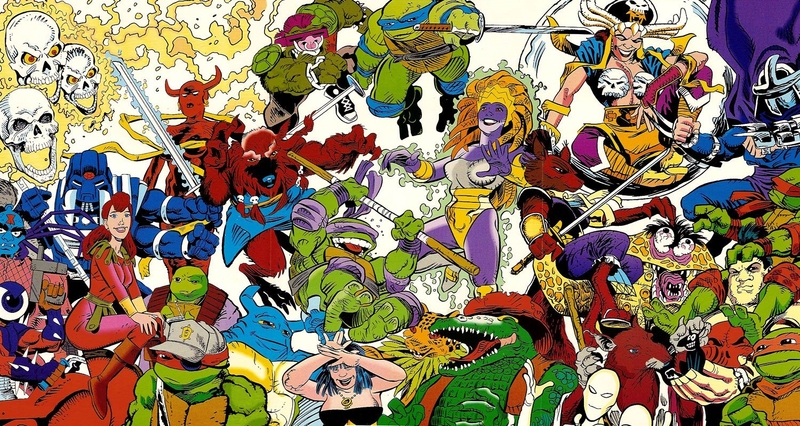 The Turtles’ cast has always been one of the strongest aspects of the original cartoon, the Archie comics, and almost all of the other incarnations of the franchise. One of the things that has always disappointed me about the Turtles games that have come out over the years is the limited representation of that very asset. There have been some notable exceptions, but even great games like Turtles in Time, which had a strong representation of Turtles villains, included only the four half-shelled heroes as playable characters. Thus, one of the things that I most want to do in my mod is pack in as many of my favorite TMNT characters as I can manage, and the great thing about Freedom Force is that, even if you don’t get to play as, say, The Fly, during the campaign, you’ll be able to use him in the Rumble Room. 15) Dirtbag and Groundchuck: These two would make a great villainous pair and some interesting foes for the Turtles. A mutant mole and bull provide a nice dichotomy in terms of powers, and they would lend themselves nicely to FF herofiles. You’ve got one who would naturally be a tank with a solid variety of ranged attacks, and then you’ve got another who could take a more support role, burrowing from spot to spot for some close in attacks. These guys aren’t characters that I’ve got a huge nostalgic connection to, but they are neat nonetheless. I actually like the idea of Dirtbag as something of villain specifically for Splinter, rodent against rodent. Likelihood: Slim. Both characters would require meshes or complicated skopes, and they are pretty obscure. 14) Wyrm and Scumbug: Here we’ve got another, but much more disgusting, pair of possible villains for the Turtles. These two characters would practically write their own mission. They both showed up in the Archie comics, and their origins were suitably tragic as to stick in my memory. The mutations of this garbageman and exterminator were not nearly as fortunate as those of the Turtles, and the resulting monstrosities battled each other, as well as everyone’s favorite green teens. Wyrm and Scumbug could form the core of a pretty entertaining mission or two, and the nature of the characters lends itself to them showing up unlooked for later on. Likelihood: Very slim. Whereas Dirtbag and Groundchuck have something of a following, these guys are pretty unloved. 13) Slash: Another Turtle, but with a decidedly more violent outlook, Slash is a character with some neat potential. Either a mutant snapping turtle or a turtle-like alien, either way Slash is a simple-minded killing machine. He could certainly serve as yet another of the Shredder’s weapons against the Turtles, but the Archie series also illustrates the heroic side of the character, so perhaps he’d eventually make a nice addition to the player’s roster. In terms of his build in the game, I imagine he’d be all damage and no defense. Also, he’d simply have to have the “Berzerker” attribute. It is the comics version that has stuck with me all these years. He’s tragically heroic, and his final stand really endeared this psychotic amphibian to the young Mr. Grey. Likelihood: Fair. Skoping him would be pretty easy since we’ve already got the other Turtles, and Slash is pretty well known. Check back soon for the next batch of picks in the countdown!